Arab protesters demonstrate against Operation Protective Edge, clash with police who try to stop them from blocking streets. MK Hanin Zoabi took part in a demonstration held by Arabs in Haifa on Friday evening against Operation Protective Edge. Clashes broke out between the demonstrators and police forces when the protesters, who numbered approximately 400, tried to block streets. Police noted that the protest was not authorized by them and that they found out about it through Facebook. The protesters waved Palestine Liberation Organization flags as well as the flag of Algeria, according to Channel 2 News. "We came to express our solidarity with the Palestinians, given the genocide committed by the State of Israel in Gaza and the killing of children," one protester was quoted by the channel as having said. "We did not come to clash with the police. It was the police that led to this confrontation." MK Zoabi was handcuffed by one of the officers, who did not recognize her and did not know she has parliamentary immunity. She was released after a senior police commander who was on hand intervened. 16 other protesters were detained for questioning. Police told Army Radio that they possessed evidence which indicates that Zoabi was an active participant in the protest and in the clashes. They also told the Hebrew-language Walla! website that they would turn to the Attorney General against Zoabi. 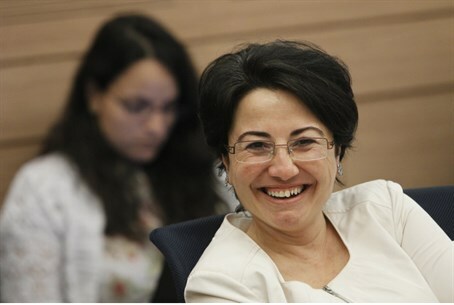 Zoabi has been linked to Hamas before, and is infamous for provocative speeches, including one in which she said that Israel has “no right to a normal life” and a later address claiming that “the Israeli occupation” was behind the murder of Israelis in Bulgaria. Recently, she declared that Israel should "thank her" for allowing Jews to live in the Jewish State. The anti-Israel MK was thrust back into the spotlight last month, after making a series of remarks defending Hamas's horrific abduction and murder of three Israeli yeshiva high school students. Earlier Friday, she made headlines again, after she published an article on Hamas's official website encouraging an Islamist uprising against Israel.